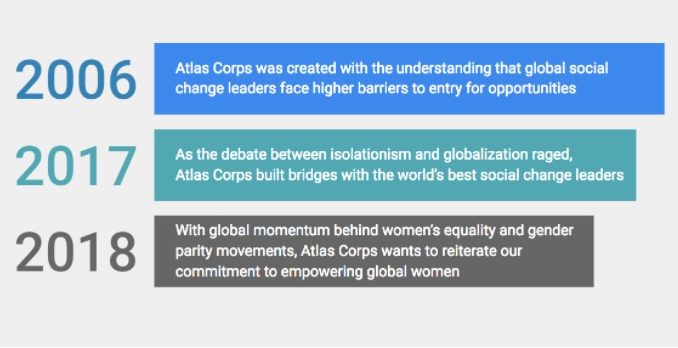 The Atlas Corps 2018 Initiative (Empower Women Globally) is part of the established Atlas Corps Fellowship–a 12 to 18-month professional exchange to develop social change leaders, strengthen organizations, and promote innovation–that focuses on empowering emerging female professionals from around the world. The current Atlas Corps network consists of 600 professionals from 88 countries–almost 60% of them being female. From all the regions in the world, we have more female Fellows than male Fellows. The World Economic Forum’s 2017 Global Gender Gap Report findings indicate that the Gender Gap is widening. At current rates, gender parity will take 217 years. But with women in leadership roles, the economic opportunity gap narrows. On a global scale, women face legal and cultural challenges that prevent them from fully achieving their role as agents of social change. Yet, research shows when you educate women, you educate a family; when you give legal and financial rights to women, you pull entire families out of poverty. Investing in women could be the highest impact form of international development. We want the world’s most talented female social change leaders to cross borders to address critical social issues. We want female social change leaders from overseas to learn best practices from the U.S. and for us to learn from them. Furthermore, the work of Atlas Corps is more important now than ever. As a debate rages in our politics and our society about isolationism vs globalization, Atlas Corps is building bridges with the world’s best social change leaders. Support the Atlas Corps international network of inspired social change leaders as they address today’s most pressing challenges in their home countries, in the US, and around the world.